Much as I like Roy Wood, the lead singer of Wizzard and thouroughly all round good egg, I'm not sure that I agree with his sentiment of "I Wish It Could Be Christmas Every Day"; it would get wearing. However, like it or not, we are gearing up for Christmas. I'm concentrating on the magic this season as I'm dipping out of panto for a year to spend more time with my dear wife and daughter. I will be back on the boards next year as Jim Trott in The Vicar of Dibley, and will also be playing the role of Tony Hancock. More of that at a later date ... let's do Christmas first. "So what to buy your loved ones for Christmas? It can be difficult, but I have a few ideas for you." Why not buy your loved one a Magic Workshop? You can send them off to my office in Olney in the knowledge that they will drink plenty of tea and come back with the ability to make handkerchiefs disappear, be able to stick playing cards on ceilings, and have a colouring book that turns from black and white into colour and then turns the pages blank. So not only will it keep them busy as they'll need to work out their routine, but on Boxing Day they can give you a show! 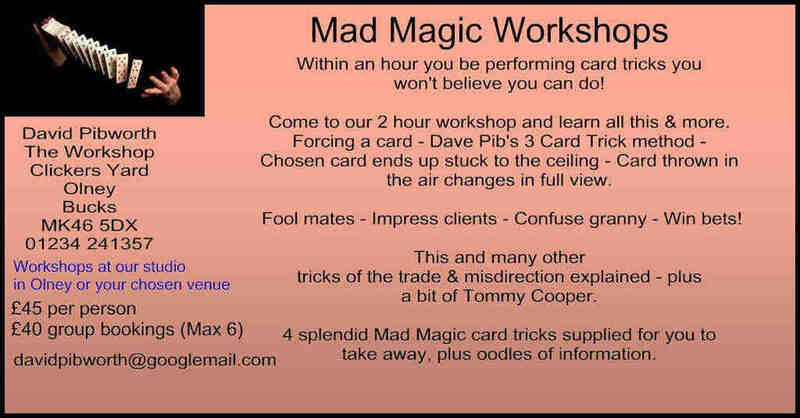 There are more detail on my website where I also sell magic tricks and gags and you can always call me for any advice. Quite a lot of my stuff is on the youtube channel called David Pibworth Productions so do have a look, and it could be a magical Christmas for you.